Spiderman tells us: “with great power comes great responsibility.” A put-upon salaryman like Ichiro Inuyashiki knows plenty about responsibility, but not so much about power. However, a mysterious explosion turns the late middle-aged family man into a mecha-style superhero. He uses his new powers to cure kids in cancer wards—a noble application indeed—but he was not the only person at that fateful explosion site. 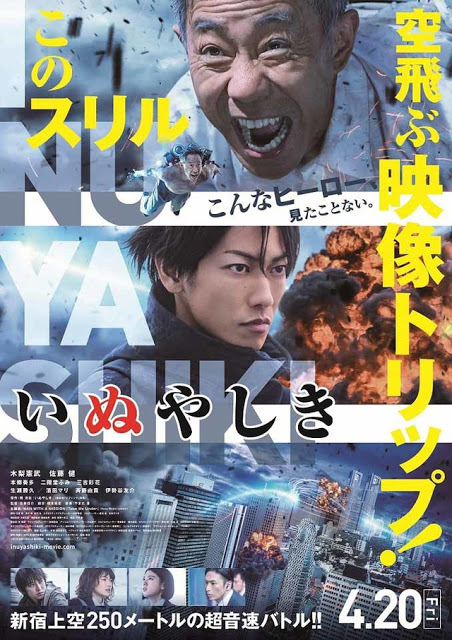 Great power also corrupts in Shinsuke Sato’s live action manga-adaptation, Inuyashiki (trailer here), which screens today during the 2018 New York Asian Film Festival. Poor Inuyashiki gets no respect in the office and even shabbier treatment at home, from his wife, son, and daughter. Nobody will even stop to listen when he is diagnosed with cancer. While out walking the abandoned dog his wife won’t let him keep, Inuyashiki is engulfed in some kind of alien energy. When he wakes, he is a cyborg with a low tolerance for sodium. Hiro Shishigami was there too. He was not a bad kid. Shishigami loves his mother and does his best to protect his childhood friend Ando from bullies. Unfortunately, he has been embittered by a series of disappointments, starting with his parents’ divorce. Soon, his reckless use of powers turns into full-fledged serial killing and terrorism. Of course, as a lifelong video-game player, Shishigami immediately takes to the new powers, whereas Inuyashiki is like Ralph Hinkley in The Greatest American Hero. 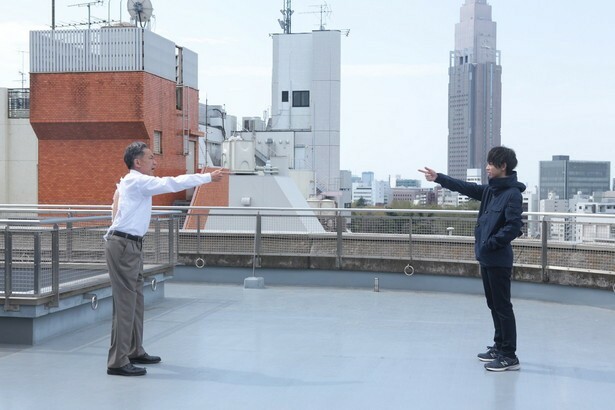 In fact, Inuyashiki could be considered a cross between the classic Stephen J. Cannell TV show and the Death Note movies, especially considering how adept Shishigami becomes at killing from great distances. In some ways, this film definitely feels familiar, but Noritake Kinashi keeps it fresh with his lead performance as Inuyashiki. It is hard to make such a woeful doormat character so engaging, but he pulls it off. He and Sato are also unusually consistent in their portrayal of the salaryman cyborg. He remains pretty much the same deferential dufus, instead of suddenly morphing into a confident, flashy-dressing ladies man, just because he can fly. Takeru Satoh is undeniably creepy and cold-blooded as Shishigami, but he is so much like Tatsuya Fujiwara’s Light Yagami in the Death Note movies, fans could get flashbacks. Regardless, the women around him are terrific. Yuki Saito is quite poignant as his mother Yuko and Fumi Nikaido is a heartbreaking wonder as Shion Watanabe, possibly the last person who is able to reach Shishigami. It is a comparatively small part for Nikaido, but she elevates it into something serious and rather meaningful. Inuyashiki is far more character-driven than most super-hero movies, but the large-scale Shinjuku climax still delivers plenty of spectacle. As far as strict logic goes, it doesn’t make much sense, but it is big and suitably apocalyptic. All things considered, it is a nice alternative to the super-slick Marvel and DC movies. After watching Inuyashiki, a lot of viewers might find themselves looking for Joey Scarbury’s “Believe It or Not” on YouTube. Recommended for its humanity, Inuyashiki screens today (7/15) at the SVA Theatre, as part of this year’s NYAFF.